The Pacific Northwest is full of beautiful scenery, lovely hikes and fun, urban cities but finding a Northwest castle for Sue’s latest word of the week was a challenge. Mount Constitution on Orcas Island is the highest point in the San Juan Islands and in 1936 the Civilian Conservation Corps built this stone observation tower in the style of a medieval watch tower right at the top. As a kid I always thought this was the perfect castle tower and have made several fun return trips with Ryan and John. 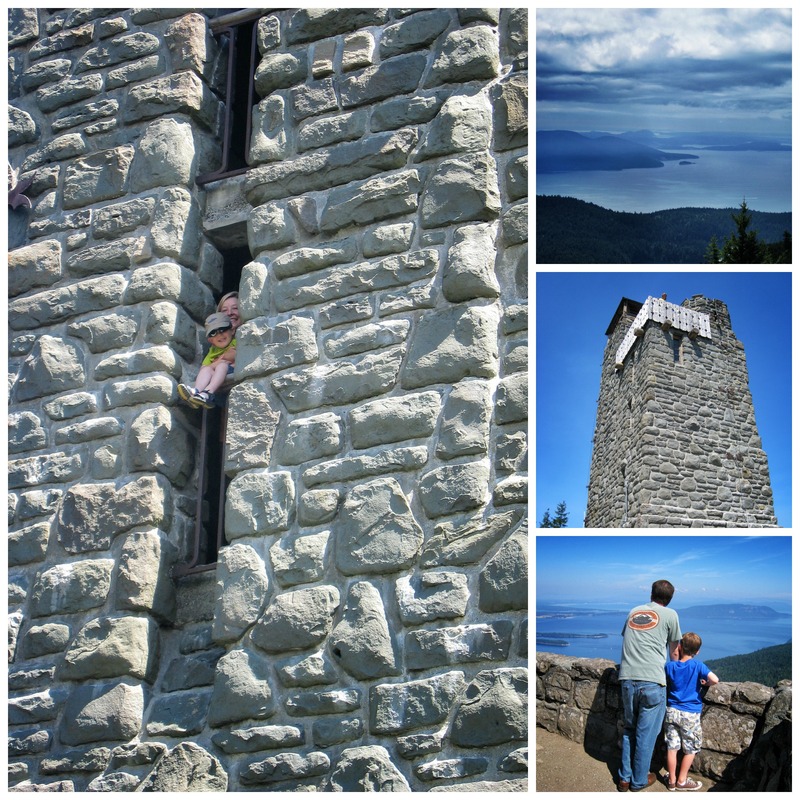 If you climb the twisting staircase inside the tower to the top platform your reward is a panoramic view of the surrounding Islands as well as the Cascade Mountains. If it is a clear day you can see north to the Canadian cities of Vancouver and Victoria, British Columbia and as far south as Mount Rainier in Washington state. I have been there and the view is spectacular. One of my favorite places. Very cool! I will put that on my list to visit when I go back, which will hopefully be SOONER rather than later! That part of the world is gorgeous!!! Our new home is a condo on the 3rd and 4th floor, with a crazy staircase from the front door and from the garage in the back – making several turns at different places. The first thing my husband said was: “I feel like I’m in a castle.” I knew that was the one…..
That sounds like a very cool place. It is a fun place to hike and every climb is rewarded with amazing views. Love your tower ! I have been wanting to do this challenge …oh boy…..
Love these shots of the scenery! Thanks! The view is just beautiful – my old camera only captured a small part of it. Thank you. 🙂 It is a lovely place! Such a lovely tower, and the views from the top sound fabulous, definitely something I would return to see more than once. Great photos.